When Valli announced Oil-free breakfast as one of the themes for BM#36, i know i m going to have big time deciding which recipe to post first. Oh yes, there are so many recipes, that can be cooked without oil or minimum oil everyday. 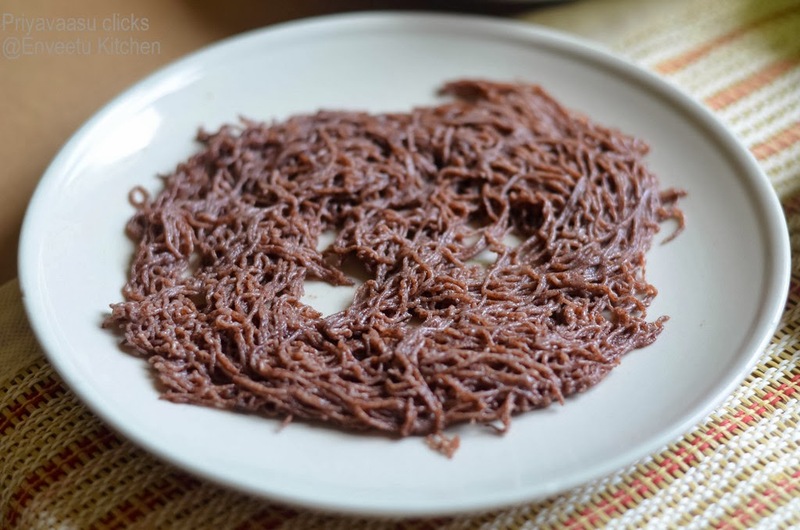 To start with i m posting Ragi idiyappam. According to WIKI: Idiyappam is culinary specialty in Kerala, Sri Lanka, Tamil Nadu and coastal areas of Karnataka The name idiyappam derives from the Tamil words idi, meaning 'broken down', and appam, meaning "pancake". 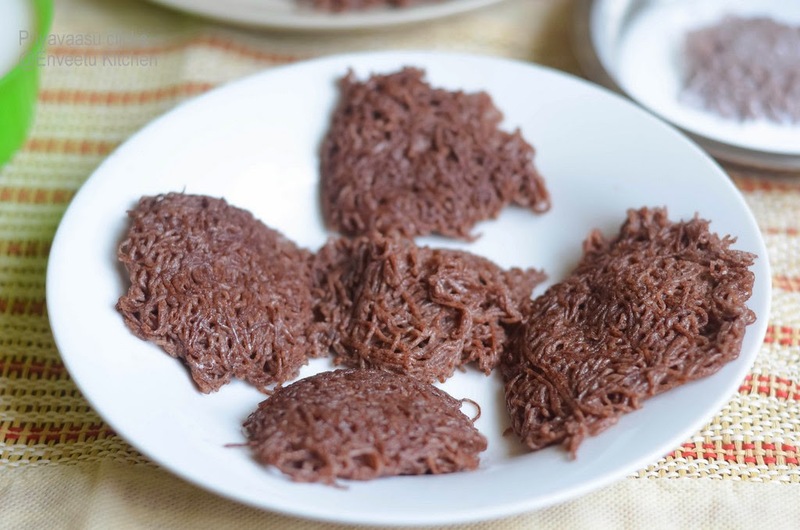 It is made of rice flour or ragi flour (Finger millet flour), salt and water. It is generally served as the main course at breakfast or dinner together with a curry (potato, egg, fish or meat curry) and coconut chutney. It is served with coconut milk and sugar in Sri Lanka and in the Malabar region of Kerala. It is not usually served at lunch. In Tamil Nadu and other parts of Kerala, it is mostly eaten with spicy curries. I personally prefer to have it dunked it dal. Dry roast the finger millet/ragi flour 2-3 minutes. Take care not to burn the flour. The flour will slightly change color while roasting. Transfer the flour into another bowl. While the flour is roasting, boil water with salt and hing. Add this boiling water to the ragi flour little by little and mix with a spoon. Take care since both the flour and the water will be hot. Cover and let it sit for few minutes, until it is warm enough to touch. Add a tsp of oil to this and knead well to get a soft dough. Divide the dough into 4 portions. Grease the idly plate, Take one portion of the dough into the idyappam press and make swirls of dough in a circular portion in the idly mould. Steam cook for 10-15 minutes. I used my pressure cooker without the whistle for steaming. Once steamed, removed the idly plate out of the cooker, let it sit for 5 mintues to cool. Then unmould the idiyappam on to a plate, repeat this with rest of the dough. Serve it hot with Coconut Milk or with some sugar and fresh coconut sprinkled over it. The usual accompaniment is coconut milk, but i had it with Moong dal tiffen sambhar. Sending this to Kids Delight - Cooking with Whole Grains happening @ +Sandhya Ramakrishnan space, event by +Srivalli Jetti . 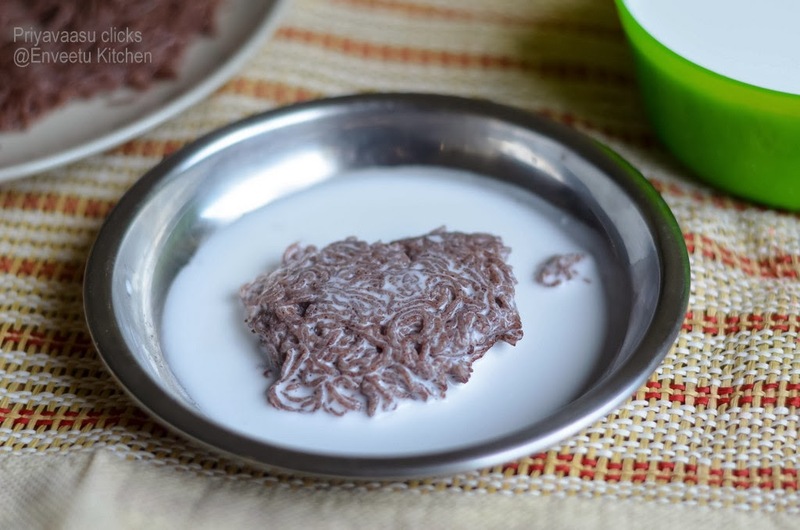 Ragi Idiyappam is a super healthy breakfast food. I would love it with stew. Ragi idiyappam is so tasty, right, Priya? Ever since I started making this version, I have stopped making rice flour idiyappam. The new UI is very nice Priya..not to mention the idiyappam..very tempting..
Love this dish. Looking forward to other oilfree dishes from you. Thanks Suma, yeah, first me too though i messed then when i tasted it, i was sure i made it right. That is an interesting recipe. Very healthy too. 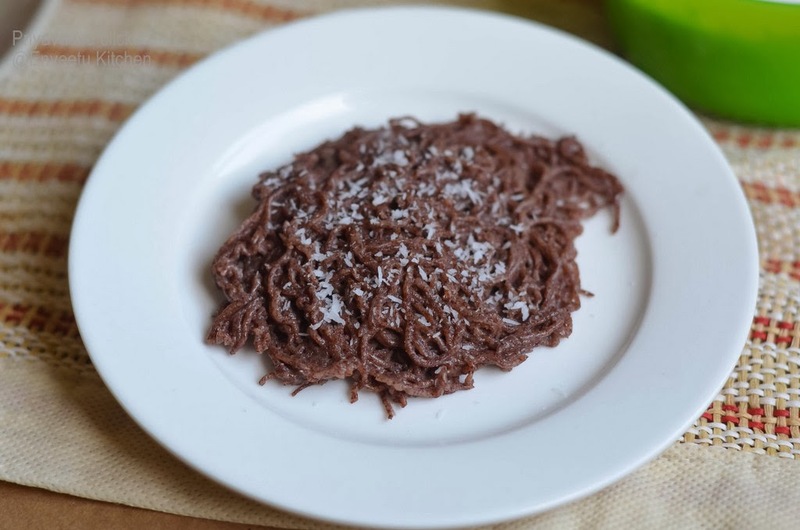 Healthy and comforting breakfast,we add 1/2 cup rice flour or idiyappam flour to ragi and make..love to have it with coconut milk and coconut and sugar..
Idiyappam with ragi looks amazing. Love the color of the idiayappam!